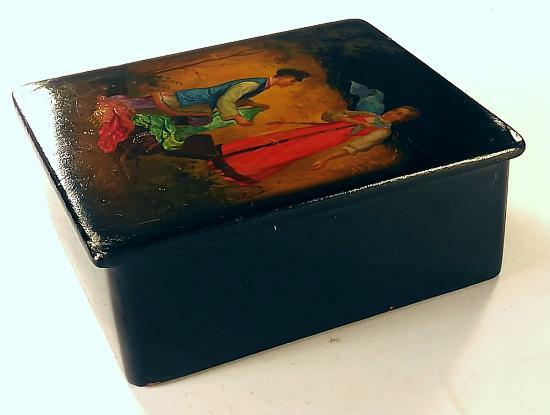 This box probably dates back to 1975 or so, and shows a man dressed in blue hoping to interest a young lady in his wares. 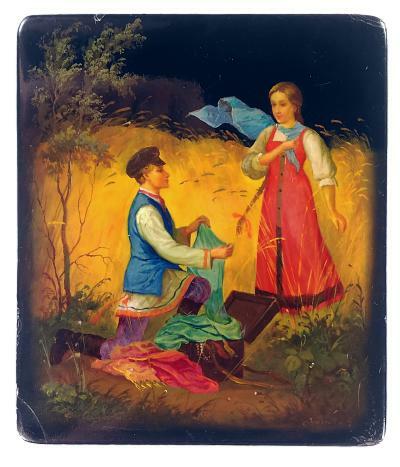 The clothes on both the man and woman have a beautiful glow from within. The faces are done tenderly and with gentle tones and shading. The black sky suggests the scene is in the evening . The sides and bottom are also black, without ornamentation. The box is made out of high quality papier mache and has a hinge at the left. the interior is red. 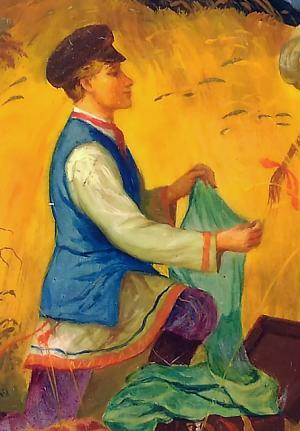 Signed with the name of the artist and village. Over the years, the box has accumulated a few flaws, the main one being a small crack to the bottom right corner to the lacquer. The top right corner also has some smaller cracks. There is also a small ding on the top edge. None of the defects really take away from the scene, though, which impresses with its feeling and genuine quality.